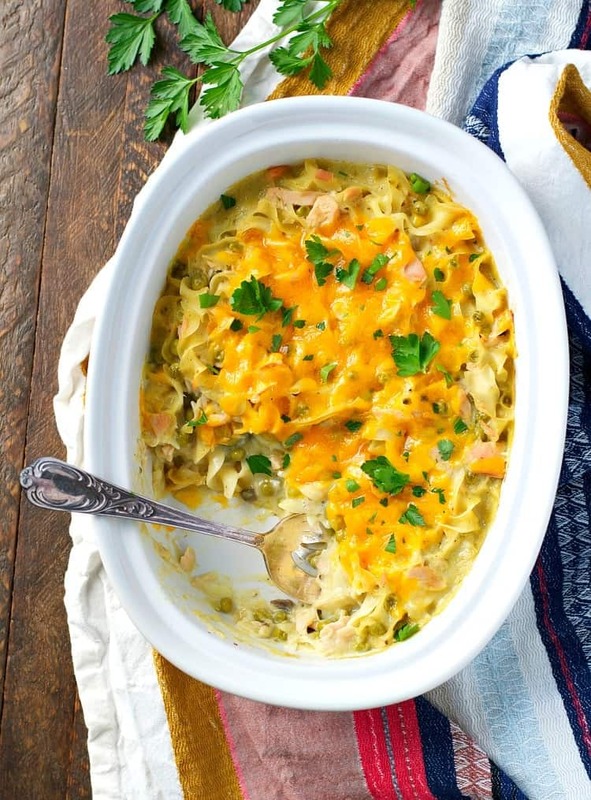 A delicious, hearty and warming tuna noodle casserole made with simple ingredients and only 5 minutes of prep. 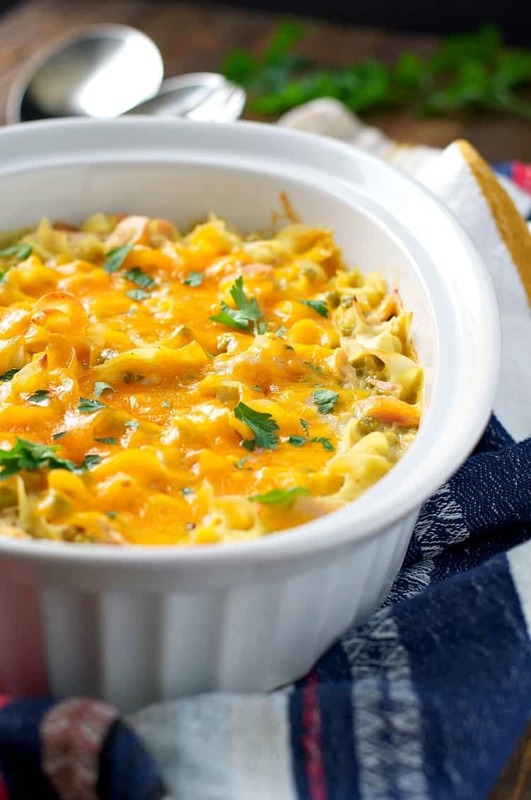 You only need 10 minutes of prep for this Tuna Noodle Casserole. An easy dinner, made with simple ingredients that’s so good it’s truly unforgettable! I’ve spent the past week or so sifting through old recipe files from my grandmother and her best friend, Aunt Bee. To say that it has been a step back in time would be a huge understatement. My grandmother passed away when I was just 13, so Aunt Bee has stepped in as a surrogate grandmother — especially in recent years. In sorting through the old files, I have uncovered personal notes that the young women exchanged, dinner party menus from the 1960’s, recipe cards that are dated back to 1959, and other personal mementos that were stashed in the folders along the way. My grandmother met Aunt Bee when their husbands served together in the army. It was a friendship that stood the test of time — after children were born and grown, after multiple military transfers, after their husbands passed away, and right up until my grandmother’s death. Aunt Bee can share stories with me that nobody else knows, and can give me a glimpse at their lives as young mothers and wives. In a recent letter, Aunt Bee mailed me her yellowed, stained recipe card for Tuna Noodle Casserole, along with a quick story about the dish. 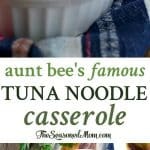 This Tuna Noodle Casserole made her quite famous among the other military wives! It’s the dish that Aunt Bee gave to other army families when (in her words), “there had been a mishap.” It’s the way that Aunt Bee showed love and support, and it’s the meal that she made to comfort her friends and family. In recent years, Aunt Bee’s daughter-in-law, Joan, ran into someone who had received one of Aunt Bee’s Tuna Noodle Casseroles after one of those tragic mishaps many, many years ago. That person told Joan that she had NEVER FORGOTTEN about Bee’s kindness and the dinner that nourished her during a very difficult time. 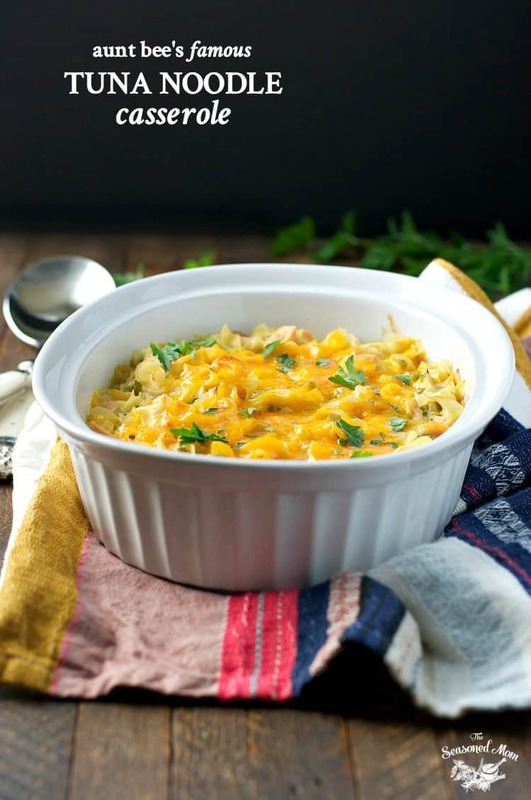 This Tuna Noodle Casserole brings tears to my eyes because I think of my grandmother, of her incredible friendship with Aunt Bee, and of the life that they shared together long before I was born. When I prepare the simple dinner for my own family now, I feel overwhelmingly blessed for the ability to taste, touch, and enjoy the same comforting meal that my grandmother and her best friend shared so many years ago. I am grateful for this tie to the past, which is so much more than just food. Use condensed cream of mushroom soup, undiluted! 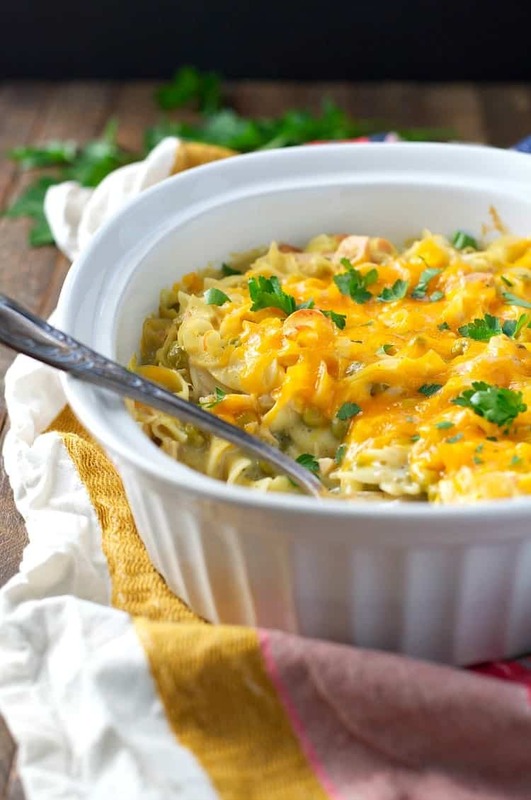 And all of the history aside, this Tuna Noodle Casserole is so darn good that it just might make you cry, too! 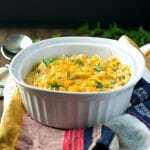 Spray a 1 ½-quart casserole dish with cooking spray and set aside. In a large bowl, stir together all of the ingredients. Transfer to prepared dish. Bake casserole, uncovered, for approximately 30 minutes (or until heated through). If you want to add some cheese, just sprinkle the grated Cheddar over the top of the casserole during the final 5 minutes of baking. Return to oven until cheese melts and casserole is hot and bubbly. Nutrition information was calculated using Campbell’s Healthy Request Cream of Mushroom Soup and whole milk. The optional cheese is not included in the calculation. Your Aunt Bee makes the best comfort food! I love when you share her recipes. And whenever I see the name, I always think of The Andy Griffith Show! 🙂 Tuna casseroles hold a special place in my heart. It reminds me of my childhood, though I didn’t have it too much because my mom didn’t like tuna. This looks SO good, Blair! I’ve got to try this out! I always wonder if 2 cups of noodles is measured before or after cooking. This is a beautiful post. I love how recipes can stand the test of time. I’m making my Nana’s potato kugel tomorrow for dinner. Even though she’s gone, it makes me feel so close to her. I also want to tell you how much I adore your blog. A friend introduced me a few months ago, and I’ve since made a bunch of your dump and bake recipes. Perfect for moms! I also recently joined Young Living, and when I received my Essential Oils mag, there you were!! Thanks for a wonderful blog!! Can’t wait to try more of your delicious creations! Meredith! Thank you so much for your kind note! I’m really glad that you enjoy the blog, and I appreciate your kind words. I agree — dump-and-bake dinners are the way to go for busy moms! Thanks so much for reading along! The next time I make homemade cream of mushroom soup I’ll have to try this as I loveeee tuna noodle casserole! Thanks, Kristy! I hope that you get to try it! Thank you! 🙂 Hugs welcome! Yum! I want to try this but hate peas. Any substitutions ideas? Hi Blair… just started following your blog recently and have already cooked a few recipes. My husband is not a mushroom fan, is there a substitute for the cream of mushroom soup? Cream of celery, cream of onion? This is so comforting I make something very similar and love it, can’t wait to try this version! I loved the story! But we did not care for the dish. I really wanted to after such a lovely story! But all we could taste was curry. I will look on for the perfect tuna casserole.